A dry start to the day after the previous day’s torrential downpours meant that we could return to our planned activities. So, after a leisurely hotel breakfast we crossed the road to the nearby railway station and purchased return tickets to the coastal town of Majori. Single tickets for the 30 minute journey cost €1.40 each with a 5% discount for return tickets. We had 20 minutes to wait until the next departure so we passed the time looking in the Finnish owned Stockmann department store that was located nearby. We needed to take the Sloka service to Majori with trains running hourly with occasional half hour services. 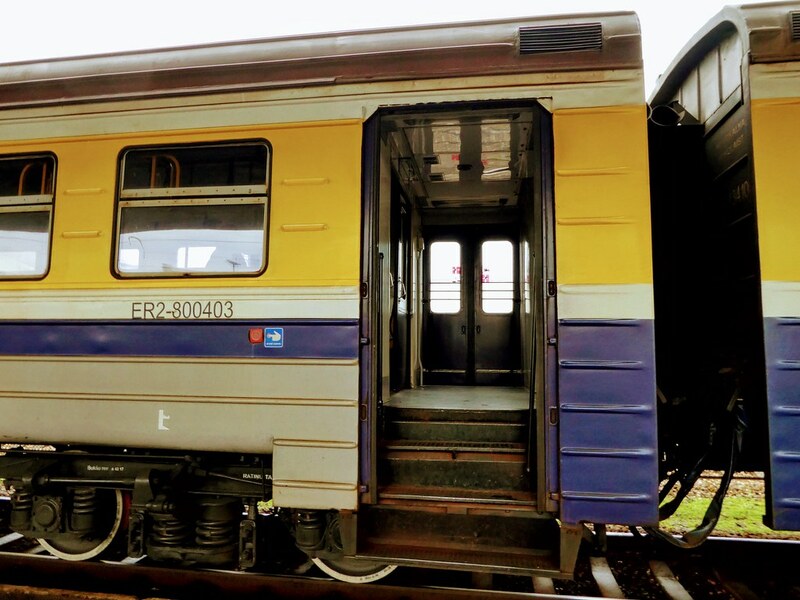 Suburban train services in Latvia run on very old rolling stock which are raised high off the ground resulting in several vertical steps making it difficult to enter the carriage. I did not see any carriages with level access so it must be difficult for the elderly or those with prams or wheelchairs to use these trains. The interior of the carriages were old fashioned with bench type seats and three pantographs were mounted on the train roof to provide power which seemed excessive for such a short train. Tickets do not need to be validated on the platform but should be retained in case the guard needs to check them. Our train departed on time and the short journey was very pleasant as we travelled through pine forests stopping at occasional small towns with quaint, wooden station buildings. Although the rolling stock is antiquated, each carriage is fitted with a screen indicating both the final destination and the next stop enabling passengers to know when they need to alight. On leaving the train at Majori there was a slight dampness in the air but insufficient to need the use of umbrellas. Majori railway station overlooks the river and just across the road we found the tourist information where we picked up a town map and an obliging clerk marked a suggested route for us to follow through the Jurmala district. 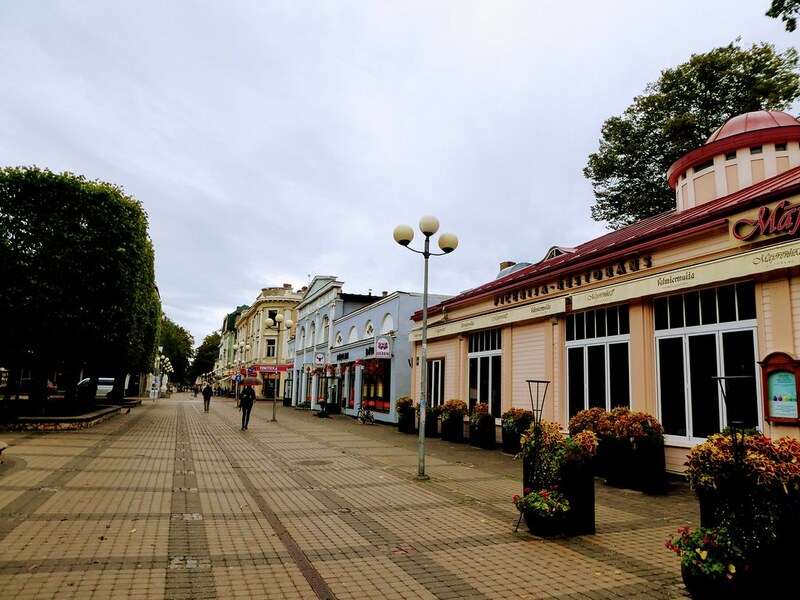 Our walk began along Majori’s pedestrianised high street where we admired old wooden painted small shops and cafes along its tree lined avenue. 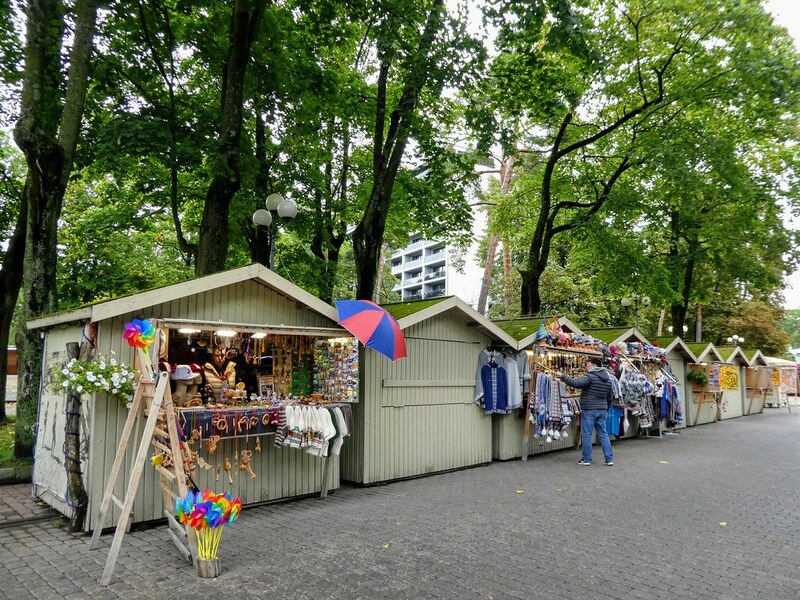 Little wooden huts selling local amber jewellery, honey and linen goods added to the appeal and I could imagine the town to be very popular on a warm summer’s day unlike on our visit when it was almost deserted. From the end of the high street we followed a path towards a forest trail through the Dzintari Forest Park. 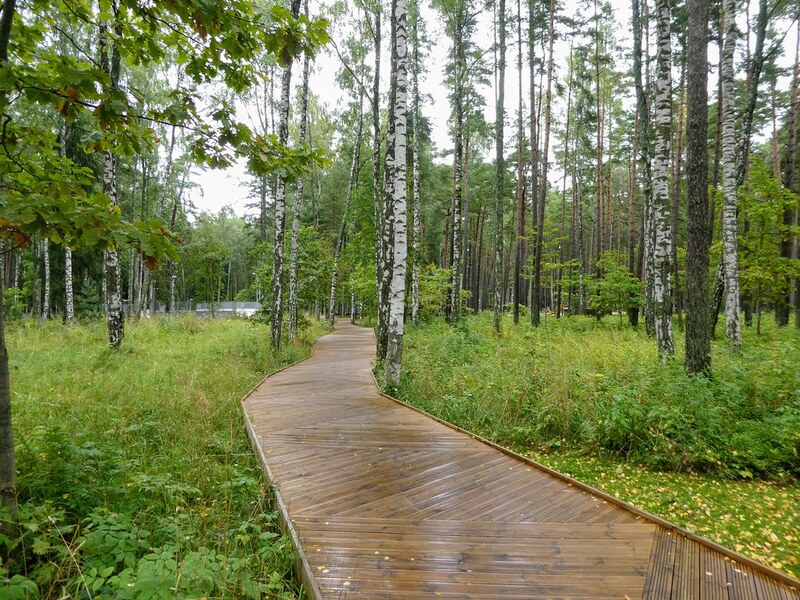 The trail, on newly laid boardwalks, wound its way through the 200 year old protected pine forest towards the sea. We passed a couple of small cafes but neither seemed to be operating so we continued on towards the sea. Between the forest park and the sea, some elegant old villas were tucked between the trees with large modern homes being added later. A large amount of construction work was taking place with high-end apartment blocks nearing completion in this affluent seaside town yet within easy commuting distance to the capital, Riga. A narrow path to one side of the road led us down some wooden steps onto the beach where we were able to continue our walk along another boardwalk built over the sand. It felt exhilarating walking along the beach on this breezy morning, there were few people about, a couple of dog walkers, three or four people exercising with Nordic walking sticks and a mother and toddler playing on the beach. We passed several beach cafes but they all appeared to be either closed or empty so we continued on our way. The beach boardwalk was well signposted indicating turnoffs to small railway stations along the line that we had passed through on our way to Majori. 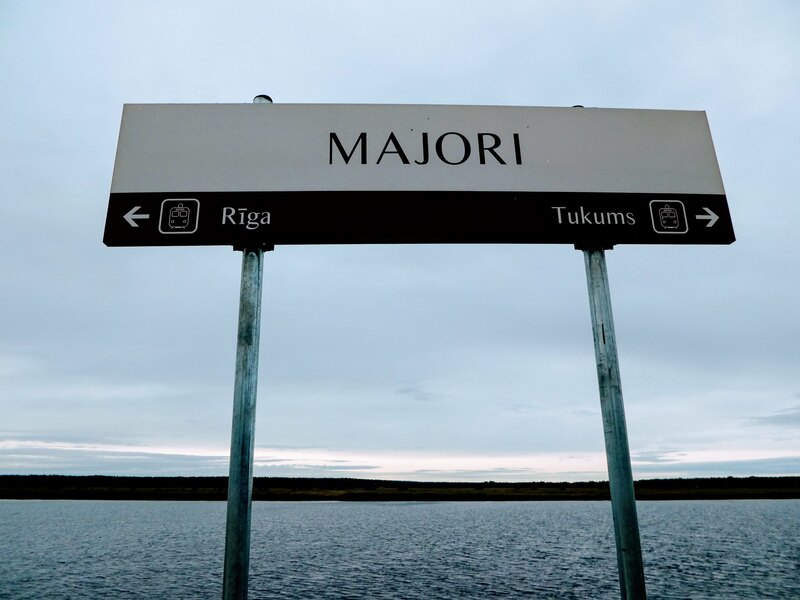 We decided to continue and complete the full 6 mile loop, arriving back at Majori station 15 minutes before the next train back to Riga was due. 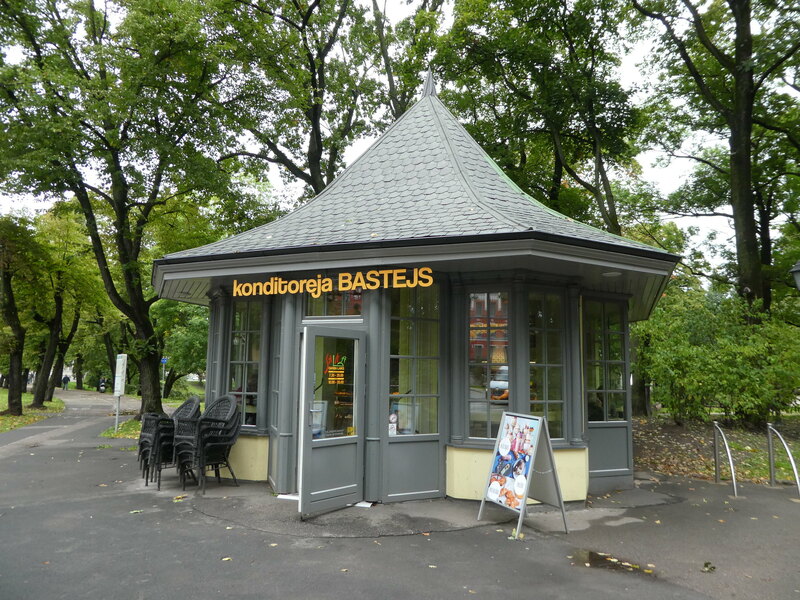 As with the outbound journey, there were few passengers on board the train and on arrival back in Riga we found an inviting little cafe for some lunch and rested our feet awhile before continuing our sightseeing by the Daugava river. Walking along the edge of one of Riga’s many parks we climbed the steep winding pathway to the viewing platform in Bastian Hill Park. From here our guidebook promised splendid views over the city rooftops of church spires and onion shaped domes. I think this would be possible in winter but on our visit dense foliage was obscuring most of the views. Nevertheless, views over the canal from the park’s humped back bridge were good and it was only a few steps off our route to the Daugava river. Reaching the river we enjoyed a stroll along the promenade towards the Vansu bridge which is 28 metres (92 ft) in length. 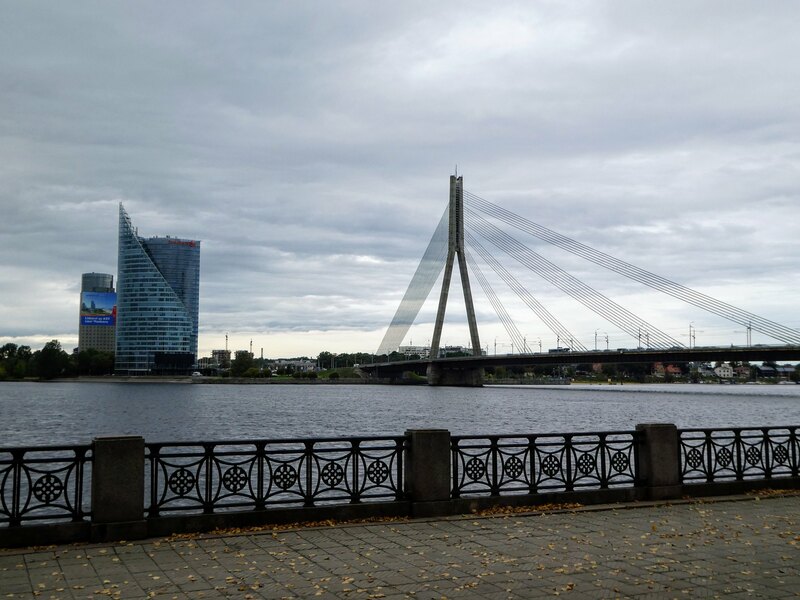 The river is extremely large as it passes through the city nearing the end of its journey into the Gulf of Riga. The Daugava starts its life in western Russia before flowing through Belarus and then into Latvia, a total of 1,005 km. The views across the river were much better than earlier in the week and I was pleased to be able to take a photograph of the castle which presides over the city. 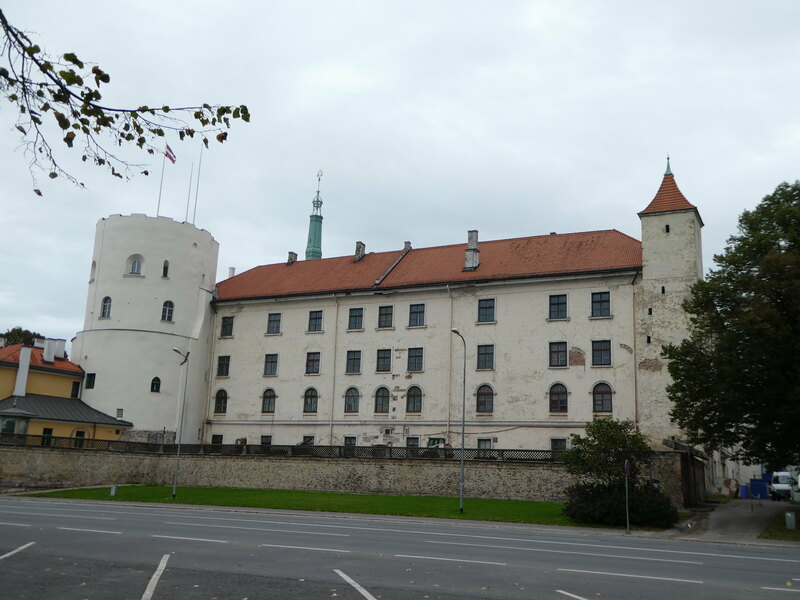 The castle was founded in 1330 but was rebuilt between 1497 and 1515. Today it is the official residence of the President of Latvia. A stroll through the cobbled lanes of the old town followed, finding new sights to explore in the maze of narrow streets. It was so nice to note that locals and tourists alike were enjoying the afternoon sunshine sitting on flower adorned wooden terraces enjoying snacks and drinks. A rest in the hotel followed before a hearty Latvian dinner and a late evening stroll. Apart from a little drizzle we had a very pleasant walk along the beach. Nice pictures.You have a good eye. Thanks for your kind words Kenneth. I’ve never been to a Baltic country. I must see one. Yes, Leo Ai think you should. They are all different but equally beautiful! Thank you for taking an interest in my posts on Riga, it was quiet on the beach but still very pleasant. 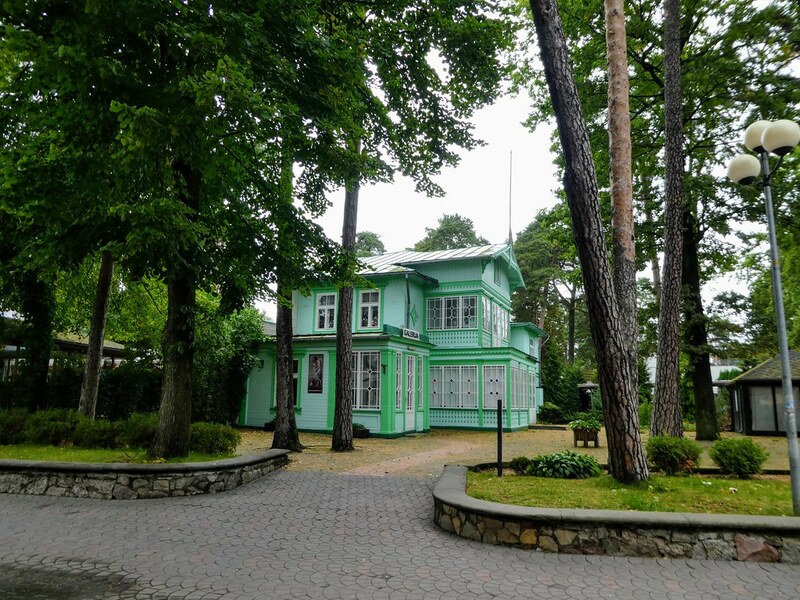 Have been to Riga but never made it out to Majori – will have to add it to my list, looks lovely! Majori is lovely, hope you get there one day. What an adorable place! Thanks for sharing! Thanks Dani, we really enjoyed exploring the district. You’ve gotten me so interested in Latvia! Thank you! That’s so nice to read Angela, I’m certain you would enjoy visiting Riga. Great photos and Majori looks like a fascinating place for a day trip. Didn’t realise that you could get to the beach so easily from Riga. Nice post. Thanks Jonno for your kind words. 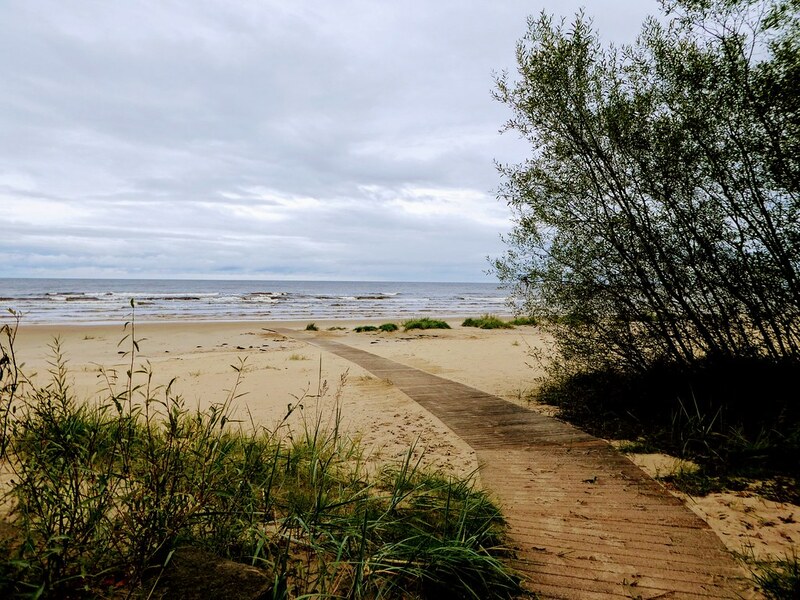 Yes, it’s very easy to access the beach from Riga and Majori / Jurmala are such pleasant places to visit. An excellent description as always with photos to support. I loved the boardwalks and of course the cobble stone roads. I wonder why all those cafes were closed. Perhaps not many tourists? It was very quiet there Ian so I suspect that most of the cafes only operate at weekends and in high season. We visited Majori on a Friday morning so that was probably the reason. They must operate business in other places during the week or they’d not survive on just weekend tourist traffic. Lovely to see Riga and Jurmula active and busy once more. Things have sure changed and spruced up since I was there in 1969 and 1971.. Thank you for your comments, glad to find that the changes have been for the best! Nice, I’d rec Cesis and Jelgava too for a quick trip. Thank you for the ideas,, I’d like to go back to Riga sometime so it would be nice to find new places to visit. Both are easy trips (esp Jelgava) to go for a (half) day trip. Glad you enjoyed Riga. Wow great content! Do you mind to connect with me as well? Thank you for taking an interest in my blog . It’s good to hear from you! Such a colourful journey and beautiful photos! Thank you, it’s so nice you enjoyed my walk around Majori.